Sometimes I am an idiot. Sometimes I say things that are so stupid, the only recourse is to publically confess and wait for the hostile reaction. So here it goes: years ago, when first in London and dizzy from the choice and variation of the museums, I dismissed (dismissed!!!!) the Victoria & Albert Museum, in its entirety, with a wave of my hand and these moronic words “the V&A is like the attic of a rich, crazy old Aunt. I have no interest in the place.” No interest in the place, indeed. What a fool. The Chihuly chandelier alone…. I have since spent many an afternoon and evening strolling through the rooms of the V&A admiring things I didn’t know I coveted. Silver punch bowls. Stained glass. Groovy furniture. All that jewellry. On a recent visit I noticed that everyone who works there is extremely good looking. Maybe being surrounded by such beautiful objects has that affect on people? And then there are the special exhibitions. If I wasn’t already regretting my ridiculous statement while oogling boots from Tsarist Russia, several years ago, I definitely knew how wrong I was when I fell under a spell of enchantment at the supurb David Bowie extravaganza, last year. 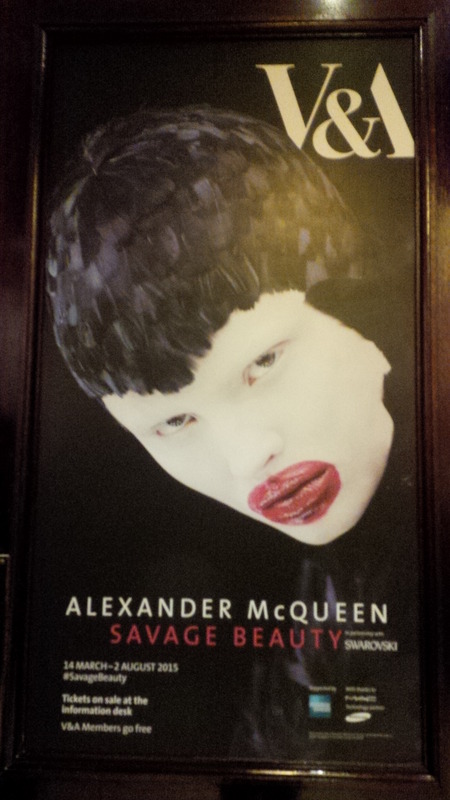 And now Alexander McQueen. Savage Beauty is not so much a show as an experience, an experience that leaves you gasping from the sheer brillance of his work and the dedication with which it is showcased. I won’t embarrass myself further by trying to say something insightful or provacative about McQueen. I simply don’t have the vocabulary. But this show overwhelmed me. With love and fear and awe. How can something so seemingly simple as a dress be beautiful and scary and an object of obsession all at the same time? Because it can. And it isn’t simple. Most things worth wanting aren’t. Instead it creates an invisible, but powerful connection that stays and stays and stays. Such is his work. His work which was his passion. Perhaps that is a great part of the attraction for me. My passion is London. 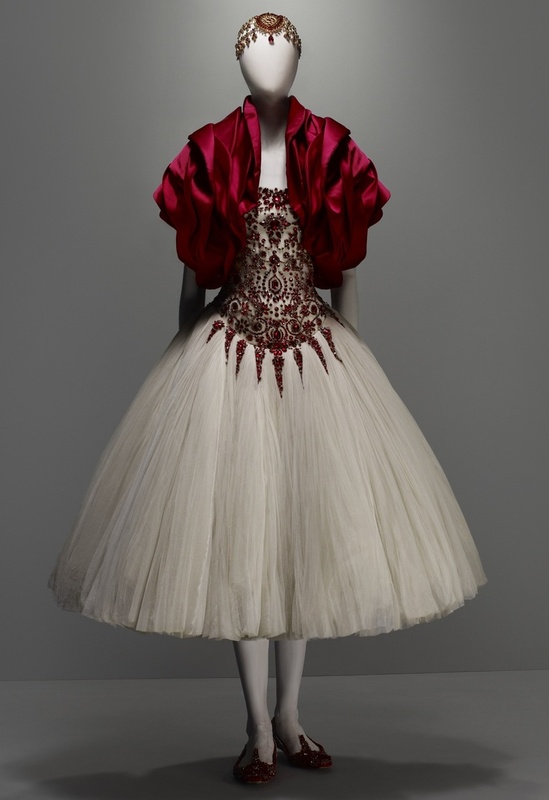 And Alexander McQueen IS London. He is London’s passion. Even more now than when he was still alive. Passion and Obsession. Yes, that is it. But it is a damn good show as well. The Cupboard of Curiosities is a curatorial triumph. A sensory overload of the most delicious kind. Everything, all the time, everywhere, and a little more too. I could have stayed there for hours and still not taken it all in. Kate Moss as a hologram instantly made me think of Tinkerbell, as she whorls and twirls in the air. When it finished I wanted to do as JM Barrie instructed and clap my hands and shout “I believe in Fairies,” just to make sure she didn’t fade away for good. Passion and obsession indeed! At the beginning of exhibtion I made notes of all the clothes I think would look particularly good on me. But the list became unwieldly very quickly. For the record, anything from the The Girl who Lived in A Tree (Autumn/Winter 2008) and the Irere (Spring/Summer 2003) collections would suit. And ALL of the shoes. So if any of you out there have your own attic of treasures and wish to share, let me know. Beg, borrow, steal, tickets to this show. 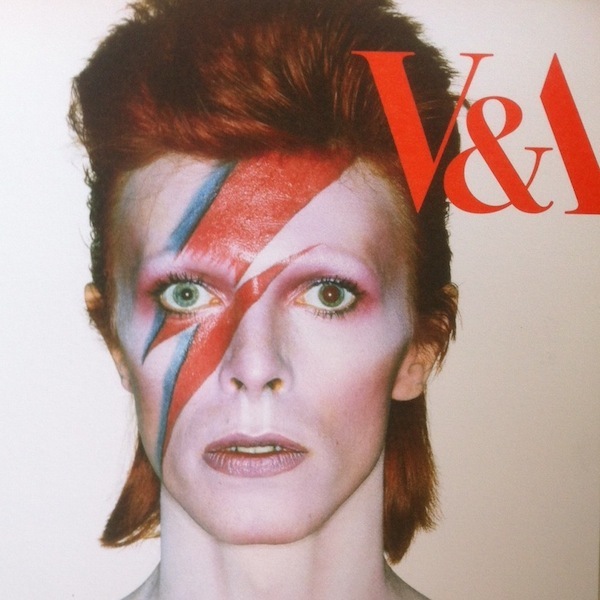 Or better yet, become a member of the V&A, as I am going to do, so the whole ticket problem goes away. If only to see this show. Again and again. With passion. And Obsession. And Awe.